Release Recap: Nike Zoom KD IV - "Weatherman"
Join us as we take a look back at this weekend's release of the KD IV inspired by Durant's childhood dreams. 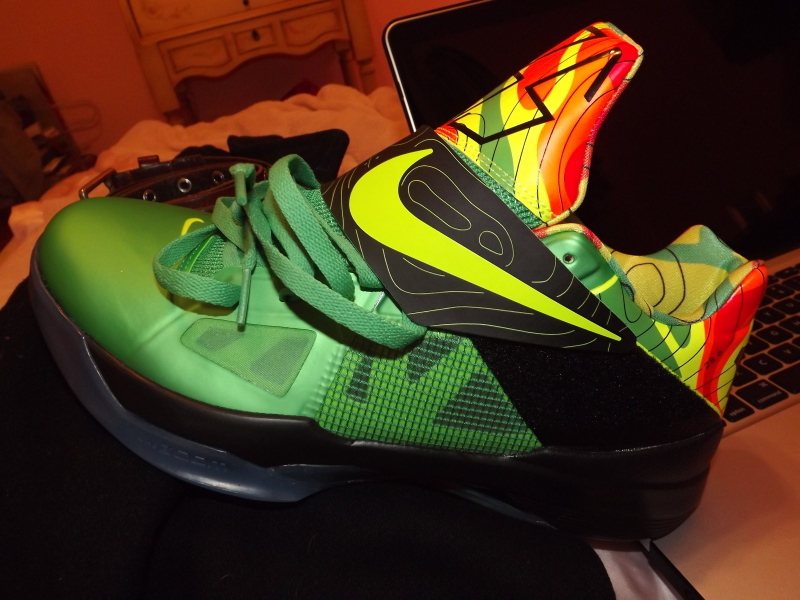 1_Fly_Guy gives us a look at his unique lace job on the "Weatherman" KD IV. While the NBA season was in question for the last few months, some of the games biggest stars began to wonder where their passion would have landed them if they weren't hooping. Blake Griffin shared his dreams of hosting his own talk show, while Andre Iguodala saw himself on Wall Street and KD recalled his childhood dreams of becoming a weatherman. Their dreams brought to life the Nike Basketball "Lockout Pack," highlighted by the "Weatherman" KD IV. 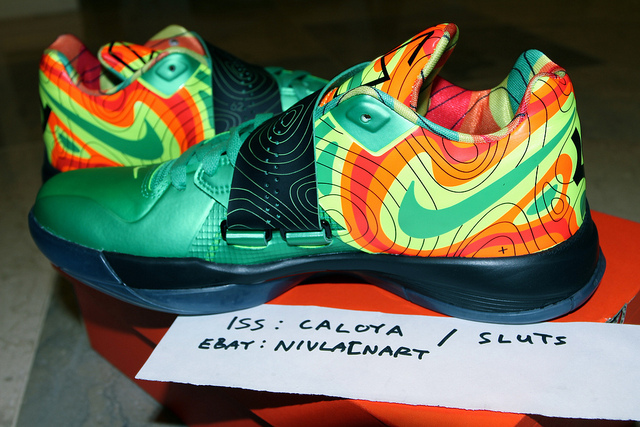 KD's childhood dreams were interpreted with a Sonics-esque colorway, inspired by a green screen and traditional Doppler radar readings. KD's actual foot mapping is seen through the translucent outsole, finishing off KD's weatherman-inspired kicks. The Nike Basketball "Lockout Pack" was released in limited numbers over the weekend, causing a number of sneaker collectors, KD fans and pesky resellers to line-up for a shot at by far the most popular model in the pack. Selling out within minutes, many collectors believe the "Weatherman" KD IV will be recognized as the shoe which helped Durant break out onto the sneaker scene. For those that picked them up, was the "Weatherman" edition your first-ever KD signature line purchase or just an addition to an on-going KD collection? WIll you be hitting the court in them, putting them on ice or reselling? Share your responses, thoughts, photos and pick-up stories in the comments below, as we recap one of the most anticipated releases yet in KD's blossoming signature collection. Vizzini provides us with an on-foot look at the "Weatherman" Zoom KD IV. 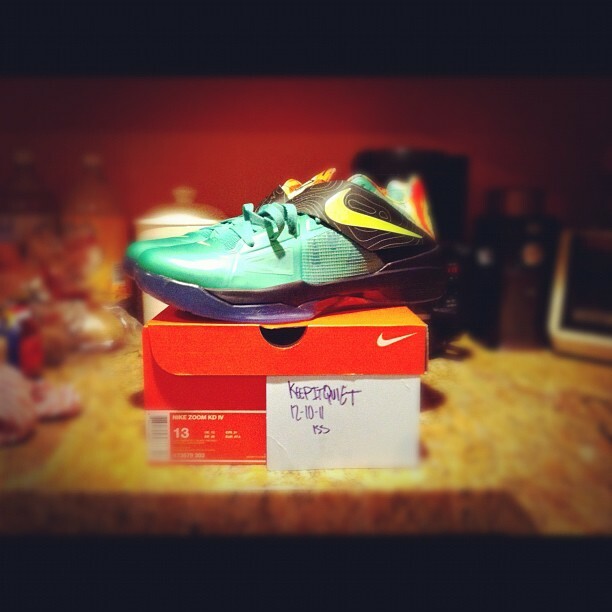 KeepItQuiet was luckily able to get his hands on the "Weatherman" KD IV. 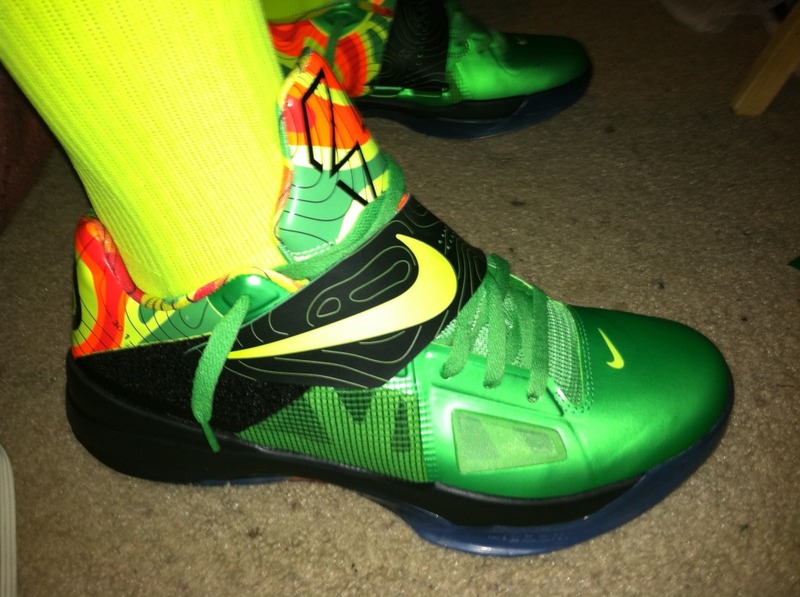 Coloya provides us with a great shot of the Doppler radar detailing seen on the 'Weatherman" KD IV. 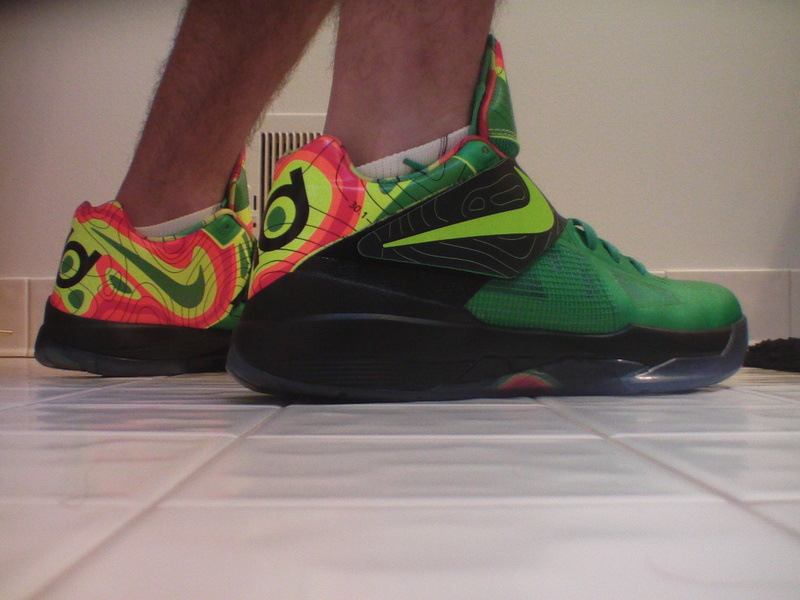 Another on-foot look at the "Weatherman" KD IV, provided by fatboicrack. 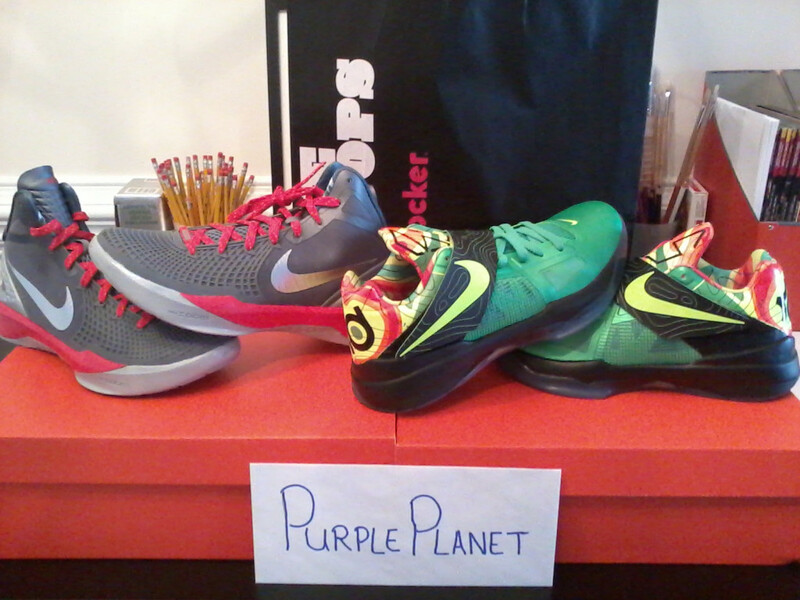 PurplePlanet scooped-up the "Blake Show" Hyperdunk '11 and the "Weatherman" KD IV.